Hi my name is Alexandra Radovan and I am from Bunbury in Western Australia. I am 23 years old and I have been diagnosed with POTS. I was fainting regularly, I had major gastrointestinal issues, I experienced dizziness and extreme levels of fatigue. I also experienced muscle paralysis that caused me to use a walking frame, sometimes a wheelchair, and I had to be hospitalized for quite extensive periods of time – so far this year 2 months – because when my symptoms were really bad I couldn’t look after myself. I couldn’t shower or go to the toilet on my own. Sometimes my arms wouldn’t work and I couldn’t feed myself. So, it’s been quite a big change from my regular pre-sickness stage. When in the program did you start noticing a difference in your symptoms? Well, the first day that we started the biofeedback training, after that session I actually didn’t need to use my walking frame to get back to the car. My walking frame has been in the car since then. I haven’t had to use it for the last nearly two weeks now and I’m planning on keeping it that way. I can walk faster. I’ve noticed that I am not as tired. Pretty much all of my symptoms have eased or totally disappeared. I haven’t fainted. It’s been amazing. From the first day of training, I noticed a difference. What sets Dr. Kyprianou’s program apart from other treatments you have tried? The biggest thing with Dr. Kyprianou is that she addresses the problem with the autonomic nervous system and she looks at it as a whole. The treatment is meaningful and it’s purposeful and it’s going to actually make a change. It’s going to do something different. It’s treating the problem from where it starts rather than each individual symptom. What brought you to the POTS Treatment Center? My family and I, we were very upset with how my life had changed and how little I could do, and I was worried about how I would cope with POTS for the rest of my life and what my life would look like. We were kind of at the end of what we could do when we found out about this treatment program. We just knew that we had to try it because what if something changed? Even if I only got better a little bit, it would still be worth it. So, I would say to anyone, find a way. If money is a problem – we didn’t have any money – we fundraised and we raised $45,000 for me to come from Australia. We managed to raise it through GoFundMe in two months. All I can say is that this program has changed my life and I wish every POTS patient could do it, could experience it. I see so many young people on Facebook with POTS, young women, who are so discouraged because they think that their life is going to be terrible when this treatment option is right here and it’s available for everyone. Was there a special moment when you realized you were feeling better? I think I’ve been amazed. It’s been everyday where I feel like I’ve had a moment when I’m like “Wow! I just did that and I couldn’t do that before!” or “Wow! I just felt really happy!”. I’ve noticed a difference, but I think the biggest thing for me was the first Saturday after a week of treatment. We went to church and I sat through the whole service without fainting or without having to lie on the floor. I could walk out of church afterwards. I even stood up and sang. I could concentrate through the whole sermon and I was happy. That’s when I realized that I was getting better and that the treatment was working and that I did have a normal, healthy body and that my life was going to turn around and it was going to be meaningful again. So that was my one really special moment because I haven’t been able to sit through church in nearly a year. 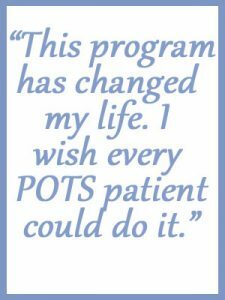 What would you tell others about the POTS Treatment Center? Well for one thing, POTS is awful, everyone knows that, and it’s scary. Doctors don’t tend to know what is going on with your body and it’s usually really hard for you to explain to other people. And it becomes discouraging and you feel hopeless. I mean, that’s how I felt and that’s how many people I’ve talked to have felt. The one thing is when you come here for this POTS treatment, the people that are here understand you, they believe you; they acknowledge that what you’re experiencing is very real. Then they provide you with the tools and the treatment to actually repair your body so that you can be who you used to be. And I’ll just say to anyone that you’ve got to come. What I’ve been able to do in the last two weeks has just blown my mind and my family can’t believe it.